We recently had the pleasure of meeting with the premier authorities on the avifauna of Michoacán, who visited us in Pátzcuaro. Dr. Laura Eugenia Villaseñor Gómez, ornithologist, and Dr. Fernando Villaseñor Gómez, bird ecologist, are a brother and sister who are both professors at the Universidad Michoacana San Nicolás Hidalgo in Morelia. These two professors come from a large family whose father always took his ten children on camping and nature outings. Because of the love of nature instilled in them, four of the children are now biologists, and most of the brothers and sisters help with the Doctors Villaseñor's numerous avifauna projects. The father is a painter and illustrator of the birds of Michoacán, and Dr. Laura Villaseñor is currently working on a book of his artwork which will be published next year. We eagerly look forward to celebrating this event and to seeing this important work. Georgia Conti is a Seattle Audubon Master Birder who now resides in Arocutin/Pátzcuaro, Michoacan. The Pátzcuaro Birding Club benefits greatly from her expertise and passion for birding. Dottie Yturri is a visiting birder from Marble Falls, Texas, who came to experience birds, the wonderful mountain climate and the beauty of Patzcuaro and surrounding areas. She was accompanied by her husband, retired Judge Ed Yturri (not pictured). Glen and Tracy Novinger bird from their home in Pátzcuaro. I enjoyed your notes about birds in the Patzcuaro area. I have a bird identification that you or your colleagues may be able to help with. My question is about differentiating female bumblebee hummingbirds from female broad-tailed hummingbirds. On Aug. 9, 2008, I was birding just south of Tres Marias which is just south of Mexico City on the way to Cuernavaca. I saw a female hummer that I think was a female bumblebee hummingbird: it was a bit smaller than the male broad-tailed hummer I had seen earlier in the day and had a prominent white forecollar and obvious rufous on the top of the tail. I have never seen a female broad-tailed and am wondering if the prominence of the forecollar and the clearly seen rufous in the tail in the bird I saw are enough to rule out a female broad-tailed. How prominent are these 2 features in female broad-tailed hummingbirds? 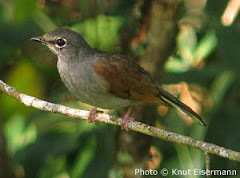 Also, I think I can rule out females of Allen’s and Rufous due to location and time of year. Another curious feature of the bird I saw was that it hovered with its tail cocked at 90 degrees to the body - apparently a characteristic of the bumblebee hummingbird. I would appreciate any advice you can give me – thanks very much. The broad-tailed hummer is 3.7 in. and the bumblebee 2.8 in.,a very significant size difference. I would first consider size. I have watched the bumblebee hummer at length from a distance of 3 feet and it is truly amazingly tiny. The rufous patch may be significant, but maybe we can get someone who ranks higher on the hummer guru ladder than me to weigh in on this. Anyone? I understand that you now have this sighting pinned down to the female Bumblebee Hummingbird. Le felicito.